DOWNTOWN BEETLE WITH BIKES. Sam and I rode the Canal downtown at sunset on Sunday. In the background is Merchants Plaza, historic St. John's church, and Pan Am Plaza. 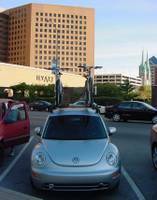 The bug is parked on the southside of the Indiana State Capitol building.